Wean Green Glass Feed Cubes are fantasticaly designed while keeping your child's safety in mind. Volume: 120 ml (4 oz. ), with line markings at 30,60,90 ml. Easy Clips: The lock system on the lids is designed for parents on the go. There are four locks that hold the lid in place, while keeping the food in and the air out. Safe Materials: Nothing to Hide! BPA, PVC, Phthalates, and Plasticizer FREE. Extremely Durable: The container is made out of extremely durable glass that is designed to withstand extreme temperatures. The containers can go straight from the freezer, to the microwave, to the table to serve your precious baby. Glass is an environmentally product that is 100% recyclable. Stylish Shape: The sleek, stylish Wean Cubes are easy to clean and dishwasher safe. The glass container is designed to ensure that the food that goes inside stays fresh and pure. Airtight Seal: Wean Green's Glass Cubes are equipped with a silicone seal. The seal is designed to lessen leakage and make the container airtight. Measuring Lines: Measuring lines on the side make proper portioning easy. Theres no need to buy different sizes for different stages and growing appetites. 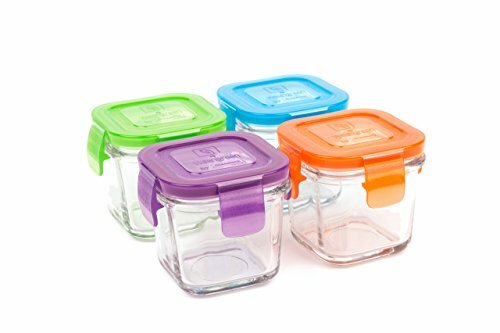 Wean Green's Wean Cubes tempered glass food containers are perfect for keeping homemade baby food fresh and free from harmful chemicals! Also great for storing breast milk, packing salad dressings, condiments, and toddler snacks on the go. The leak proof silicone seals ensure that you can drop them in your bag with no spills. The seals are removable to ensure no bacteria build up. Lids are durable and have passed the 'use' testing machine over 3 million times per tab! The child friendly design allows easy opening for small hands and the glass is 4-5 times stronger than a drinking glass! Wean Cubes are freezer, microwave, & dishwasher safe. Cubes stack beautifully in your freezer and easily go from the freezer, to the mircrowave, to your table.